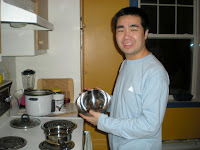 I'm a condensed matter physicist at McGill University and I love to cook and bake. One summer, I worked as a knife salesman and met people daily. Each of my customer tells their story on how they love cooking. At the end of each appointment, some gave out their favorite recipe. Hence, since the beginning of my graduate study, I have organized a collective cooking once every week among collegues and friends. It started as a small group and people got interested in joining whether they are food admirers, unhealthy eaters, lazy cooks or just skeptics, they are all welcome. This blog is dedicated for those who have been bugging me to create one. Click here to read how this blog got started. The recipes posted here on Random Cuisine are made by myself and the people from my collective cooking . They come either from their own creation or from various sources such as friends, family, customers, cookbooks, website, local supermarket, etc. The recipes are easy, fun and simple to work out. If we can do it, you can do it.